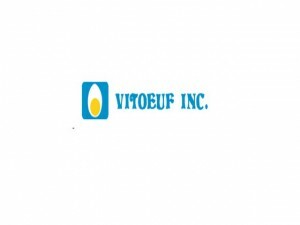 Vitoeuf Inc. is a Canadian company that is engaged in egg processing. The company has its headquarters in Quebec, Canada. Vitoeuf was established in 1984 and was already originally focused on egg processing. The company got its name from the two words, “vit” (French for quick) and “oeuf” (French for egg). During the company’s first ten years, the main egg products manufactured were known as the “Express Egg.” This product was actually preservative-free hard-boiled eggs that were vacuum-packed. Vitoeuf’s Express eggs became popular primarily because the product was unique in the North America area. At that time the company also produced eggs in brine (brine being a preservative). In 1994, Vitoeuf’s facility was expanded to include a processing system for a new product, ultra-pasteurised liquid egg. This new product was sold under the brand “Ovoflo.” The resulting expanded facility now had an area of 23,400 sq. feet, from an original area of 7,000 sq. feet. Vitoeuf emphasizes very strict sanitation procedures in its processing areas. This is done in order to ensure maximum quality of the ovo-products. The company’s employees are always under supervision and training for the purpose of maintaining the products’ excellent quality as well as maintaining high work standards. Vitoeuf strongly favours additive-free ovo-products. Without any additives, the eggs’ organoleptic properties are maintained. The company also takes steps to ensure that the most common pathogenic bacteria are eliminated from the final products. Because they are free from preservatives, “Express” eggs are able to maintain their natural texture and taste. “Ovoflo” eggs also retain their natural emulsifying, foaming and coagulating functions. Vitoeuf’s customers are mostly foodservice companies that include hotels, hospitals, bakeries, restaurants, pastry shops and similar food establishments. The company also supplies egg products to some industrial companies. Today, Vitoeuf processes about 700,000 eggs every week. The company has 14 employees working full-time and 3 employees working part-time. Vitoeuf continues to grow slowly but steadily as demand for egg products continue to increase. Currently, the company’s main goal is to supply different ovo-products and still be able to maintain the eggshell’s natural interior. With this kind of product, some people’s tasks, like culinary chefs, are made significantly easier as the tedious process of egg peeling is eliminated.